The ever so going town of Yelm as of today seems to be an expanding bedroom community. Very little people know of the Yelm that once was the “Berry Capital of Washington“. Yelm has seen its varieties of agricultural products, worker, and hard times but those times have come and gone. The jump start to Yelm and its agricultural community was the Donation Land Claim Act of 1850 that opened the doors to many settlers to find a little place of their own to grow prime produce and quality livestock. Many of the people that lived in the Yelm area in the late 1800’s grew only what they needed to support their families. The Yelm prairie as James Longmire saw it was “covered with grass that was belly high to the horse.“ When he arrived in the mid 1800’s the prairie was dominated with Fescue grasses that were a native species to the area and would later be harvested for the advantage of the farmers. The farmers used the grass to feed their livestock and to sell to other livestock producers for a lucrative profit. The one thing that made this possible and was the beneficial to many farmers of the time was the Donation Land Claim Act of 1850 and later the Homestead Act of 1863. These grants were given to white males and “half-breed” Indians, land grants up to 640 acres per male. There were also opportunities for males under the age of 18 that were unattached; they could acquire up to 320 acres. With the land that many men aquired came immense responsibilities. The work that followed wasn’t intended for the weak of heart. Many became self-sufficient and grew enough to keep their family needs satisfied. The main reason for the isolation of many farmers was that the plots that were claimed were so big that the closest neighbor would be a mile away. The reason for the limited expansion of agriculture at this time was simply there wasn’t a large enough work force to create an agricultural based community, however that would soon change. Livestock production was one of the major agrarian features in Yelm in the late 1800’s. The reason being was that major exploration of soil cultivation and labor demands wouldn’t be met until the early 1900’s. The people who would fulfill the demands in the early 1900’s would come by railroad and poorly developed roads. Other groups that would contribute to the labor force would be migrant workers and workers form the timber industry after it had dissolved in the 1920’s. The workers gross income for their labor was determined on how many hours worked or by how many pounds of berries pick in a day. The average income for most adults was around ten dollars a day. The people of Yelm worked on the land and many knew nothing but the land. This would soon change and agriculture would start to fade away. In the late 1800’s the farmers in Yelm equaled 67%, those people raised domesticated animals and many depended on what they raised for subsistance. In later years the number of people that farmed would go down for the reason that many didn’t have the money to manage the farms. Those that lost out became laborers on other farms. In 1900 the amount of farmers dropped to 52.3% and again in 1910 to 27%. The farming in the area needless to say, wasn’t vanishing from Yelm but was being distributed to fewer farmers. Those farmers that could survive bought the land from those that couldn’t. 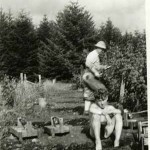 The two major agricultural areas that the town of Yelm prospered from were berries and dairy products. One would overcome the other but only after unpredictable acts of nature that would decimate a large portion of the crop in the area. 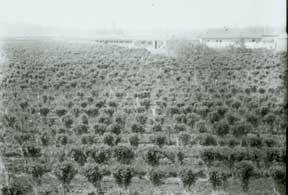 The produce of choice in Yelm during the early 1900’s had become cane berries; blackcaps, blackberries, and raspberries. These berries became very successful for the reason that many where native to the land and thrived in the area. 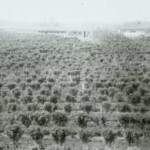 The production of the berries during its peak in 1929 of land would exceed 800,000 tons of berries on 485 acres . The gross return for that year was $64,000 at 8 cents a pound. That same year America fell into a great depression what would leave a laceration on berry farming in Yelm, but the depression wasn’t the only reason that berries in Yelm would soon go under and make way for the dairy industry. The mosaic plant disease spread through Yelm crippling many berry farmers and killing 79% of the berry crops in Yelm and the surrounding areas. Farms that depended on berries for their major source of income were lost and forced to sell to dairy farmers. After this disaster many farmers turned to government aid programs of the depression. Close to $70,000 dollars was given to the farmers of Yelm to assist them with funds that had been lost by the shortcomings of their crops. the area, because of there need for many other materials, just didn’t milk cows they, also grew silage and corn for their own livestock. This was a major reason that the dairy industry owned so much land in the Yelm area. The dairy industry appeared to be much more independent than the berry industry in 1939, The return profit was a 29% return for the dairy industry compared to the 15% berries industries return. Though at this point in time, dairy farmers seemed to be unstoppable juggernauts, they would soon take a fall and slowly fade from the scene in the Yelm area. 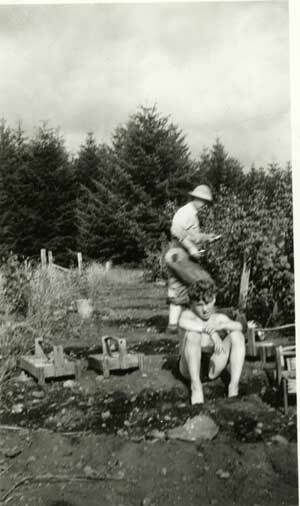 Farming in Yelm had been one of the major incomes for the area early on in its youth. The small, changing scene of Yelm has seen many faces. From the berry and dairy industry, to troubles that could have never have been foreseen and people that could never be replaced. These things have given the little town character that has been somewhat forgotten, but will always be a part of its history. Pioneer Settler - George Edwards. Reminiscences of Erastus Light of His Journey Across the Plains With the Longmire-Byles Wagon Train of 1853. Throws Light on Debated Medicine Creek Treaty Edwin Ells Presents Carefully Studied Paper to Pioneers’ Gathering on Famous Agreement Entered Into Between Governor Stevens and Washington Indians. 1857 - Indian Agent Report for Nisqually, Puyallup, etc. The Property of Jacob Stone. Nisqually and S’Kokomish Agency, Washington Territory, August 16, 1886. 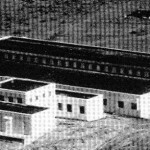 Lackamas - Only thing missing from restored school is kids.